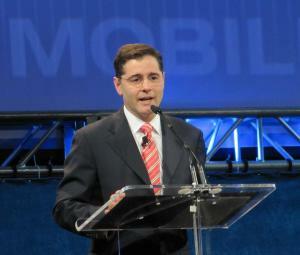 Last week at the International Consumer Electronics Show (CES), FCC Chairman Julius Genachowski announced a new plan to “open up a portion of the wireless spectrum for faster and more reliable WiFi devices.” Specifically, the FCC will work to open up the unlicensed slice of 5 Mhz spectrum to make way for Internet devices “to relieve WiFi congestion at conferences, at airports, and in people’s homes”. Though there is no concrete timeline set, the fact that the FCC has acknowledged the problem and is committed to providing a solution is fantastic news for everyone involved in the Meetings & Events Industry. Especially for mobile web-apps like Conferences I/O. WiFi availability is the biggest barrier that we face in terms of customer adoption and though the application works very well for attendees connecting through their mobile data plan (3G, 4G, etc. ), event organizers often don’t want to rely on using personal data plans, as service can be spotty at times. 1. Purchasing WiFi packages can be very expensive. Venues often charge upwards of $20,000 for WiFi systems which can be problematic for organizations interested in using Conferences I/O. The cost of our application easily fits into nearly any budget but if the event was not already planning on providing WiFi, finding room for an extra $20,000+ can be very difficult, and lowers the value return on our product. 2. Current networks cannot always handle the capacity needed. Even for organizations with the budgets to purchase WiFi, the current networks can’t always support upwards of 10,000 attendees. Networks setup for large Conferences or Trade Shows can crash or slow to a crawl, rendering internet useless — as was the case at CES this year. WiFi accessibility is not an issue for every Conference (otherwise we wouldn’t be in business) and is being improved everyday but the cost and capacity limitations are barriers that we currently face. An intervention from the FCC to open up space on the spectrum would be a huge contribution to all parties involved in the Meetings & Events industry. We eagerly await any new announcements. 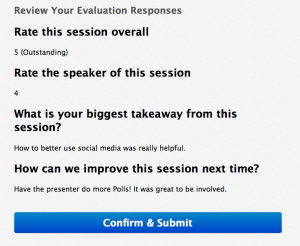 We recently added a new feature to Conferences I/O called Evaluations. We decided to integrate this new feature after we heard a resounding demand from organizations that were struggling to achieve high participation rates on their session evaluation surveys. Many organizations are limited to having attendees fill out evaluations on physical paper or sending out a survey link in an email which usually results in low participation. The new Session Evaluation feature allows attendees to fill out the evaluation right from their mobile device, immediately after the session ends. They can even fill it out as they’re walking to their next session! The evaluation results are not visible to other attendees and all of the data can be exported to a spreadsheet which is organized by session.